Since realizing that sugar, and not fat, was the major problem in the modern Western diet, The Skeptical Cardiologist has been ratcheting down how much sugar he consumes to the smallest possible amount. This has lowered what I like to call my “sugarstat,” and has made me exquisitely sensitive to the presence of added sugar in foods. With this sensitivity comes the heightened realization that added sugar is everywhere. The obvious sources are soft drinks and other sweetened beverages, candy, cakes, pies, cookies, donuts and fruit juices. Once you mostly eliminate such things from your diet you become aware of the “background” levels of added sugar in other foods. For example, when I consume what many Americans probably perceive as a “healthy” granola bar (from even the most natural or organic of manufacturers), all I can taste is a sickly sugar taste overwhelming all the other ingredients. Low-fat yogurt (which I have compared unfavorably to a Snickers Bar here) tastes like pure sugar mixed with odd chemicals and a vague dairy flavor. Seemingly healthy sushi tastes too sweet to me as it turns out to have lots of sugar mixed in the rice and the popular eel sauce is mostly made up of sugar. Most annoying is the current trend for restaurants to put a “balsamic glaze” loaded with sugar on perfectly good vegetables like brussel sprouts, ruining them for me. A review article in the Mayo Clinic Proceedings (1) this month presents the case for fructose (from glucose and high-fructose corn syrup) being the major cause of our obesity and diabetes epidemics and thus, the major contributor to cardiovascular disease in the US. Fructose is a monosaccharide that combines with the monosaccharide glucose to form sucrose, which is what most people recognize as sugar. Processed foods commonly contain a lot of added fructose-containing sugar but also, increasingly they contain high fructose corn syrup (HFCS) which contains up to 65% fructose. Large intake of fructose goes hand in hand with consumption of processed foods. Approximately 75% of all foods and beverages in the US contain added sugars. Consumption of added sugar by Americans increased from 4 lbs per person per year to 120 lbs per person per year between 1776 and 1994. Thanks to a dramatic increase in sugar-sweetened beverages, American teenagers consume about 72 grams of fructose daily. There are a substantial amount of observational, short-term basic science, and clinical trial data suggesting that all this added sugar, especially fructose, are posing a serious public health problem. Fructose is the likely component of sucrose and HFCS that promotes insulin resistance. In animals and humans, replacement of starch (chains of glucose) with sucrose or fructose causes increase glucose and insulin levels and reduced insulin sensitivity. Fructose stimulates epigenetic changes and metabolic alterations that shunt calories into storage depots in abdominal fat cells. In simpler language, fructose promotes abdominal fat build-up and makes you more likely to develop type 2 diabetes. The answer is NO! The fructose in fruit is not highly concentrated. Fructose makes up 1% of the weight of a pear for example. It is combined with all of the good things, including fiber and phytonutrients and vitamins, that make fruit good for you. 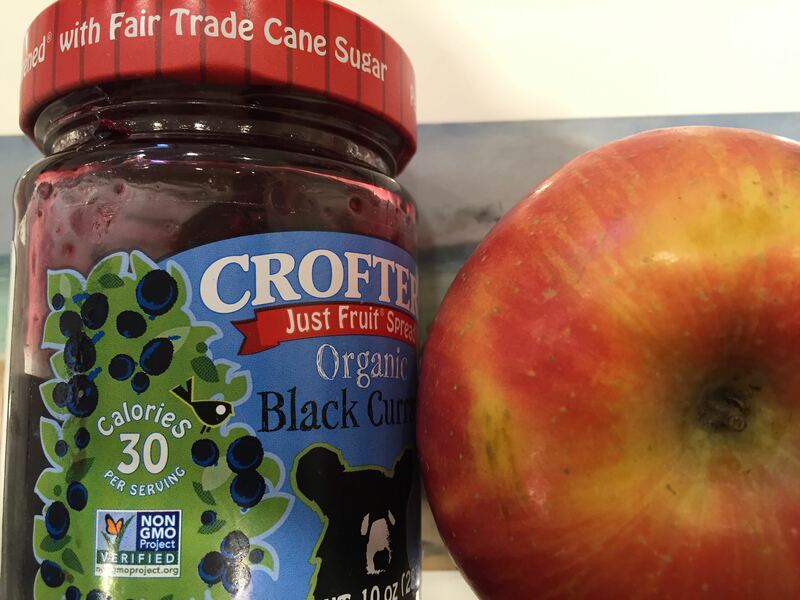 Eliminating added fructose (sugar and HFCS) is by far the simplest thing you can do diet wise to improve your health. If you avoid added fructose, you will be cutting out a lot of the processed foods and sugar-sweetened beverages which have no nutritional value but contribute to obesity and diabetes. Real fruit (right) and “Just Fruit Spread” (left). Note the attempts to make the spread appear healthy by announcing that it is “non-GMO”, glutan-free, “organic” and “perfectly sweetened with fair trade cane sugar”. Cane juice is added sugar . It’s probably not worth buying that book, but keep in mind that agave and evaporated cane juice are just different forms of sugar. Makers of organic and “natural” foods are as guilty as food industry giants at adding sugar, but they try to pretend that “natural” sources of sugar are somehow better for you.